Are you tired of toilets that just seem to clog within the trap no matter what you do? Are you looking for a toilet that can resist the colored build-ups that tend to happen over the course of a week or two? With the TOTO Drake 2 Piece Toilet Model CST744SG#01, you’ll receive a unit that has an elongated bowl design, a trap that resists clogs, and comes equipped with SanaGloss. What is SanaGloss? It’s a ion barrier glazing that cleans your toilet every time you flush it. What about the Flush Valve? – This one is 3 inches. Conventional models are 2 inches. 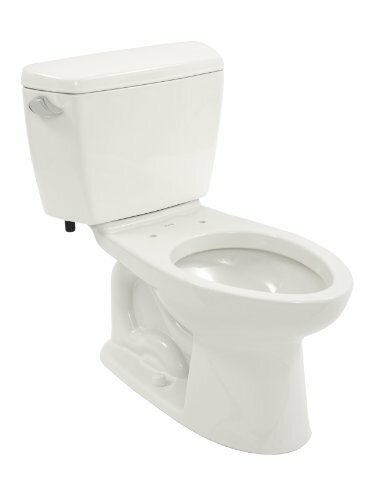 What Are the Features of this TOTO Drake 2 Piece Toilet CST744SG#01? The primary feature that we really liked with this particular toilet was the fact that it has a larger flush valve than the standard toilet that is made today. Most toilets come equipped with a 2 inch valve, but you’ll get a 3 inch valve on the TOTO Drake. This means you’ll get faster flushes that use less water, giving you a better flushing experience from even an environmental perspective! this toilet is incredibly easy to install, whether you’re replacing an existing toilet or have a new installation going on. With the modern water savings in toilets today, it’s so easy to get stuck double or even triple flushing sometimes. The TOTO Drake 2 Piece Toilet CST744SG#01 with 1.6 GPF ability, however, gives you enough pressure not only to flush once and be done, but power the flush through the wider trap that also has a SanaGloss finish. This creates a better home experience, requires fewer cleaning sessions to maintain it, and a better toilet experience. Does the TOTO Drake 2 Piece Toilet CST744SG#01 Have Any Advantages? The design of this particular toilet is its real advantage. You’ll find that you don’t have to just stand there, holding the lever, in order to get a full flush out of this one. You simply push it down once and you’ll experience the roar of the water! Although it is a little louder than your average toilet with the increased water pressure, the benefit is clear: you flush, walk away, and don’t have to worry about the trap rejecting what you just flushed! If there was one place where this toilet could be improved, it would be in the height of the toilet rim. The Drake puts you nice and close to the water, which can be an unpleasant experience at times when there is splashing involved. A thicker seat could improve this problem somewhat, which is up to you to purchase because no seat comes with this toilet. Three Way Plumbing Services created this video about TOTO toilets and why they link them 🙂 Great job! Overall, however, you’ll find that this toilet will give you a strong flush on a consistent basis. It is highly affordable, installs easily, and that’s why this item gets our recommendation today.